California was and still is a destination for people seeking a better life. Thousands of gold seekers descended on the once pastoral territory during the Gold Rush, African-Americans joined the Great Migration from the southern states, entire families escaped the ravages of Dust Bowl, actors and musicians sought fame in the entertainment industry, and farmers prospered as irrigated land transformed the region into one of the world's greatest agricultural centers. If your ancestors were from the Golden State, there is a wealth of genealogical sources to be explored as you research their history. For centuries, indigenous Native Indian peoples populated California. In the 1500s, Spanish and English explorers claimed and mapped portions of the coastal region. Spanish missionaries began building a series of missions along the coast and the region became known as Alta California. When Mexico gained its independence from Spain in 1821, Alta California was under Mexican rule. Settlers from the U.S and Canada began arriving in Northern California during the 1820s and by 1846, there was a revolt against the Mexican government. The Mexican-American War lasted from 1846 until 1848, when Treaty of Guadalupe Hidalgo ended the war. The western region of Alta California was given to the United States, and California became a state in 1850 - just two years after the Gold Rush brought thousands to the area. The completion of the First Transcontinental Railroad in 1869 brought even more settlers to California. The California State Archives stores historic records of the state government and various local government records. The collection includes millions of documents, maps, architectural drawings, artifacts, photographs, video and audio tapes. County records are especially valuable for the family historian, and the Archives contain original and microfilmed records from 28 of the state's counties, including deeds, probate, vital and naturalization records. Copies of Spanish and Mexican-era land grants are available to study. Genealogists may find information in the Archive's state agency collections, such as records from Folsom and San Quentin Prisons, professional and vocational licensing boards, business records, or the California Youth Authority records. The Root Cellar-Sacramento Genealogical Society maintains their genealogy library at the archives. The Society's California Collection contains statewide 1890 Great Registers, county histories and cemetery listings. At the California State Library, the California History Section houses a major collection of documents regarding California's history including county and local histories, city and county directories, biographies, maps, newspapers and society publications. The Library also has a significant historical photograph and manuscript collection. You can research the California Information File (CAIF) while at the Library. The CAIF is a valuable resource with some 1.4 million references to information in California newspapers, county histories, theses, periodicals, biographical encyclopedias, and special biographical files. The references span the years from the 1840s through 1985, when the collection was put on microfiche. You may also search the CAIF on microfiche in most major California libraries. The California Information File II continues the CAIF, beginning coverage in 1988. A portion of the file, containing over 50,000 records can be searched online. The Sutro Library in San Francisco has a comprehensive collection of county and state histories, city directories and telephone books from all over the United States. The Sutro Library also has over 10,000 compiled family genealogies, rare book and manuscript collections. The National Archives-Pacific Region genealogical collection includes California naturalization records, indexes and passenger arrival records for San Francisco, 1928 Census Rolls of the Indians of California, California Indian Enrollment Applications and records of arrivals and disposition of Chinese and Japanese-Americans in San Francisco. The National Archives-Riverside facility has extensive holdings valuable for genealogy research, particularly for the Southern California and Arizona regions, including censuses of Native Americans, military fort post returns and federal land records. The Western Americana collection at the UC Berkeley - Bancroft Library documents western history with the greatest emphasis on California. The collection includes archeology, ethnography, and linguistics of California's first Native American inhabitants and a rich description of the political, military and religious stories of California during Spanish and Mexican rule, including diaries dating from 1725 to 1821. The Bancroft Library also houses the dise�os (hand drawn maps) and surveys from the Spanish and Mexican land grant cases. First-hand accounts of the Mexican-American War, westward migration and the Gold Rush era are described through published memoirs, diaries, journals and letters. Genealogists may be interested in researching the Western Americana collection of personal and family papers. 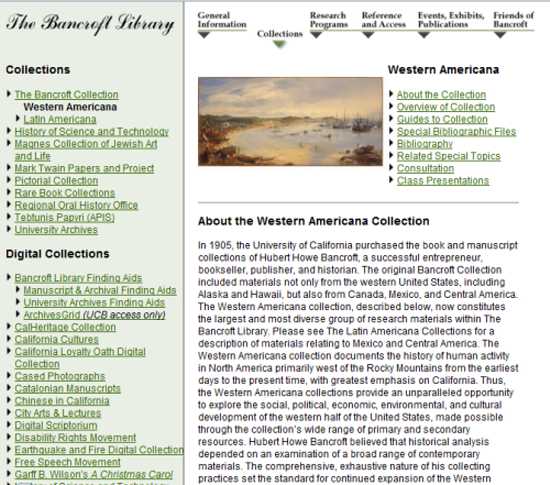 Several resources for California online research may be of interest to family historians. Huntington Library's Early California Project provides an online database to help trace people who lived in California between 1769 and 1850. The information is gleaned from California's historic mission registers - baptism, marriage, and burial records - and the results help tell the unique story of Alta California's early settlers, native Indians and soldiers. 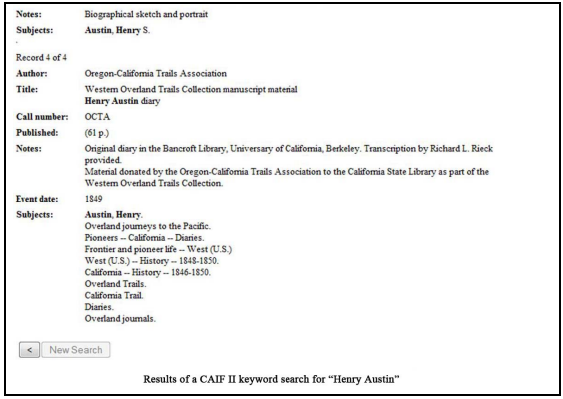 Another valuable online resource is the Online Archive of California (OAC). This database is used as a finding aid for the collections of California university and public libraries, state and county archives, historical societies, genealogical societies and other record repositories. Detailed descriptions of primary resource collections maintained by the institutions can be found through the database. The OAC contains more than 220,000 digital images and documents. To find resources catalogued in the University of California campuses, including books, journals, maps, media, electronic databases and more, visit Melvyl. The online catalog has information on records for southern and northern regional library facilities, digitization projects (digitized Google and other books), and digital content from OAC. To search the holdings of all participating libraries in California, use the online CalCat catalog. Smaller California societies and repositories often can be an excellent source of genealogical information, and have unique collections not found in the larger repositories. To find the location of these societies, visit the website of the California State Genealogical Alliance (CSGA). CSGA encourages identification, maintenance, and accessibility of records of genealogical and historical importance, and serves as an information source for the California genealogical community. As a member of the USGenWeb Project, the CAGenWeb provides a main entry point for genealogical research in counties and towns within the state of California. Each website is maintained by a County Coordinator, and offers a varied collection of county information and links. To find the CAGenweb sites of individual California counties, click the link for "Table of Contents - Counties". Official registration of California vital records began in the fall of 1905. Vital records from 1905 to the present can be ordered through the California Dept of Health Services - Office of Vital Records in Sacramento, but the wait for the documents can be lengthy. For faster processing of the vital records, order vital records through the individual county. Usually entering the name of the county in an online search engine, then typing "recorder's office", will help you find current information on ordering vital records in the region. If you do not know the exact date of the birth, marriage, divorce or death, many California libraries with genealogy collections have California vital record indexes on microfilm or microfiche. For online searching, Vital Search has both paid and free options to search California births, marriage and death indexes. You can search a portion of the California death index, covering the years 1940 - 1997, free on the Rootsweb.com site. You can also order vital records through Archives.com. Various California vital record indexes may be searched at Ancestry.com. You can use the free Ancestry.com Library edition at many libraries. For vital records that occurred before the fall of 1905, you will need to check for their availability at the county level. The Pre-1905 CA Death Index Project through Rootsweb.com is another good source when searching for pre-registration California death records. California only took one state census in 1852. This census gives information on the entire household, including an individual's state or country of birth and last residence. The census was transcribed and indexed by the California Chapter of the DAR, and the original is stored in the California State Archives. A microfilm copy of the DAR transcription is available for use in the California State Library and on interlibrary loan. There is an index to each volume of the transcription, and they are included on the microfilm. You can also search an electronic statewide index to the 1852 census in the California History Room at the California State Library. Another method for obtaining copies of the 1852 state census is through the Family History Library in Salt Lake City (FHL films 909229-34). Contact your local LDS Family History Center to order the films. The Southern California Genealogical Society published the index to the state census on a CD-ROM, which can be purchased for a nominal fee. The CD-ROM lists every name in the original microfilm, and every name in the subsequent 1935 transcription done by the DAR. The 1852 California state census index is also available through Ancestry.com. Early California censuses (called padrons) of Spanish, Mexican, and Indian residents have been published in Historical Society of Southern California Quarterly, vols. 15, 18, 41-43, 54 (FHL book 979.4 B2s). The Los Angeles padrons of 1836 and 1844 especially provide rich details of the early residents - name, age, community of residence, occupation, town of nativity, marital status and whether the person is a man, woman or child. The Family History Library also has copies of the 1790 padron on microfilm (FHL Film 1036747 Item 6). Society of California Pioneers - a museum, library, and cultural organization established in 1850, and dedicated to advancing the knowledge and appreciation of early California history.. The Historical Records of County Government in California, California State Archives, 2004 - Provides both past and present information about the types of records created and maintained by California counties.